Credit: Photograph taken by the Leonid Kulik expedition in 1930. 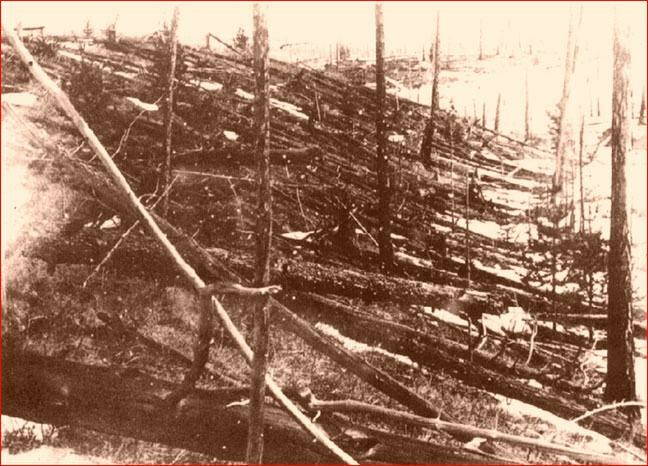 Shattered trees from the now-famous "Tunguska Event" testified to the force of the mysterious aerial explosion. The event began at about 7:15 on the morning of June 30, 1908 in a remote region of central Siberia near the Stony Tunguska River. A blue-white fireball -- brighter than the Sun, some said -- raced across the sky, then exploded with the force of a 10- to 15- megaton hydrogen bomb. The explosion felled some 60 million trees across an area of 2000 square kilometers. Yet some trees near the blast center were not burnt and a ring of burnt trees circling the epicenter was left standing. The thunderous sounds were accompanied by a shock wave that knocked people off their feet and broke windows hundreds of kilometers away. The explosion registered on seismic stations across Europe and Asia, and as far away as Britain meteorologists registered fluctuations in atmospheric pressure. The resulting pulse of air pressure circled the Earth twice, and astronomers observed for several nights afterwards a glowing red haze in the upper atmosphere, though they were not aware of the cause at the time. Curiously, reports of an unusually bright night sky began THE NIGHT BEFORE THE TUNGUSKA EVENT and continued for several days afterwards. For the next few weeks, reports suggest that the night skies were aglow to such an extent that one could read in their light. Both the Smithsonian Astrophysical Observatory and the Mount Wilson Observatory reported a decrease in atmospheric transparency persisting for several months. "At breakfast time I was sitting by the house at Vanavara factory facing North. [...] I suddenly saw that directly to the North, over Onkoul's Tunguska road, the sky split in two and fire appeared high and wide over the forest. The split in the sky grew larger, and the entire Northern side was covered with fire. At that moment I became so hot that I couldn't bear it, as if my shirt was on fire; from the northern side, where the fire was, came strong heat. "I wanted to tear off my shirt and throw it down, but then the sky shut closed, and a strong thump sounded, and I was thrown a few yards. I lost my senses for a moment, but then my wife ran out and led me to the house. After that such noise came, as if rocks were falling or cannons were firing, the earth shook, and when I was on the ground, I pressed my head down, fearing rocks would smash it. When the sky opened up, hot wind raced between the houses, like from cannons, which left traces in the ground like pathways, and it damaged some crops. Later we saw that many windows were shattered." Kulik's expedition to the Tunguska explosion site was inspired by his belief that a gigantic meteorite struck the area and that the iron recovered could pay for the cost of the expedition. He received support from the Soviet Academy of Sciences. The story is curiously similar to Daniel Barringer's investigation of Meteor Crater in Arizona (Link: http://www.thunderbolts.info/tpod/2006/arch06/060131crater.htm) -- except that in Kulik's case neither a meteor nor an "impact crater" could be found. However, a later investigation by mineralogist O. A. Kirova recovered both magnetite globules and various forms of silicate globules from samples obtained by Kiril Pavlovich Florensky's expedition in 1958. Thousands of "tiny brilliant spheres," many fused together, were found embedded like pellets in the earth and in the trees. Globules of this sort are characteristic of the enigmatic particles produced when meteoroids enter the atmosphere. (As we shall note in the submission to follow, the study of such formations leaves many unanswered questions.) The Tunguska globules occur over a fairly well-defined ellipse, with high concentrations between 100 and 200 kilometers to the north-north-west of the epicenter. Florensky suggested that this distribution might be explained by fallout downwind of the high-altitude location of the final explosion. Most astronomers today envision the cause of the destruction as either a small comet or asteroid exploding a few miles above the surface. Some estimates point to an object 100 meters in diameter. According to the calculations of Christopher Chyba of the NASA Goddard Space Flight Center in Greenbelt, Maryland, only a stony meteorite would explode at an altitude of 10 kilometers, the commonly agreed height of the Tunguska blast. A comet of the assumed size would disintegrate much higher in the atmosphere and cause less damage on the ground. Yet scientists are still arguing over certain unexplained events and the fact that no samples of the "impacting" object have ever been found. "If a group of experts cannot agree for almost a hundred years, it's probably a third option," says Wolfgang Kundt, an astrophysicist from the University of Bonn in Germany. Andrei Ol'Khovatov, an independent Russian physicist who is intrigued by the Tunguska event, agrees that the impact theory leaves too many unanswered questions. He points out, for example, that witnesses reported strange weather and increased seismic activity in the area for days BEFOREHAND. The absence of a coherent explanation has inspired a host of speculations. Some exotic theories suggest a miniature black hole passing through the earth, or a miniature "bomb" of anti-matter. Alternatively, either an exploding alien spacecraft, or an alien-produced nuclear bomb has been offered. Some suggest that it was Tesla testing his "death ray". As a light-hearted jest amid the carnival of speculations, electrical theorists wonder if a "microscopic packet of neutronium" (the fictional content of "neutron stars") might be the next explanation offered.